Somebody has been sending this to people and I’m sure it’s a scam. Please inform your friends so they don’t fall for this scam. 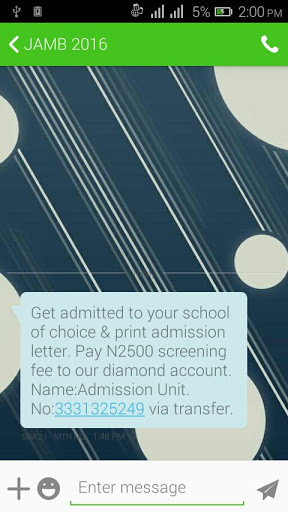 The message is something like this..
Get admitted to your school of choice & print admission letter. Pay N2500 screening fee to our diamond account. Name:Admission Unit. No:3331325249 via transfer.